December 8 is the National Brownie Day, a food-related holiday for chocoholics. A chocolate brownie is a dessert bar, which is very popular in the United States and Canada. A chocolate brownie was first made in the United States at the end of the 19th century. The name “brownie” was first used in 1896. The earliest published recipes for this pastry date back to the early 20th century. 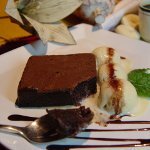 There are some myths about the creation of the chocolate brownie claiming that this delicious dessert was created by accident or as a result of improvisation. A brownie is a cross between a cookie and a cake in texture made with flour, sugar, chocolate or cocoa powder, butter, and eggs. Brownies can be cakey or fudgy. They sometimes include chocolate chips, nuts, frosting, or other ingredients. Brownies can be sprinkled with powdered sugar or topped with whipped cream. Chocolate brownie is considered a cookie rather than a cake because it is typically eaten by hand. Brownies are common lunchbox fare as wall as a popular dessert in restaurants. They can also be considered comfort food. To celebrate the National Brownie Day, you can bake a chocolate brownie, pick it up from your favorite local bakery, or go out to a restaurant and treat yourself to a warm brownie served with ice cream.